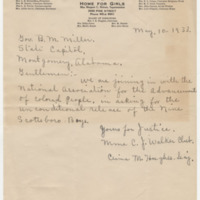 The letters, petitions, flyers, telegrams and postcards in this digital humanities exhibit reflect the wide interest in the cases not only from across the United States but also around the globe. International attention to the cases is evident from the petition circulated by Nancy Cunard of Hours Press and the Cunard family shipping lines, signed by London and Paris-based artists, intellectuals, and thinkers. Signers included Sinclair Lewis, Ezra Pound, Samuel Beckett, Salvador Dali, Gala Dali, and André Breton, who demanded “impartial justice” through the “unconditional and immediate liberation” of all nine Scottsboro Boys. 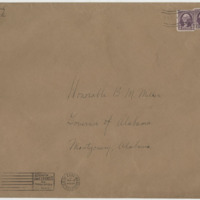 A telegram from the Committee for Deliverance of the Victims of Scottsboro, signed by a group of Berlin-based intellectuals—Professor Albert Einstein, Thomas Mann, Kaete Collwitz, Alfons Goldschmidt, Lion Feuchtwanger, and Karl von Ossietzky—asks Governor Miller to “reserve the execution” of the Scottsboro Boys following the 1931 trial and to stay the execution pending the Alabama Supreme Court review. Browse the International Opinions documents.